What you've heard about the Middle Ages might be all wrong! 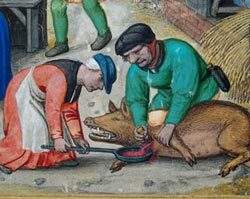 Recently, I saw a documentary about food that got me thinking about the similarities and differences between dining in the Middle Ages and how we eat now. It also made me think about all the misconceptions surrounding Medieval cuisine that have been printed in school books. One of the biggest differences is that now, once we are adults, we are responsible for our own food choices rather than having our food prepared for us by someone else everyday. We have to make hundreds, even thousands of food decisions everyday. From the moment we wake, we have to decide whether to eat or not every moment, since food is always at hand. We need to choose what to eat and when, how much, whether to heat it or not, where to eat, how much to spend, etc. With all this decision-making comes responsibility to make good decisions, but we are so bombarded with advertisements encouraging us to make bad ones, it is hard to make the right decision every time. In period, most people couldn't cook, nor did they need to know how. 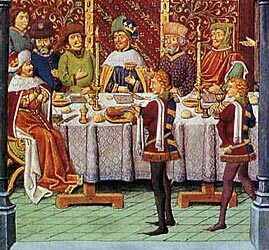 They either ate with their family, or if they were employed, they ate with the other servants in the great hall. Household specialists worked very hard to provide tasty meals that were healthy and nutritious. Professional cooks who worked in castles or large manors had to be able to read and write so they could keep track of the large quantities of food they bought. That gave rise to a trade in cookbooks all of which had large sections on what foods could be served to the sick. So diet and health were inextricably linked even then. Except on feast days, the wealthy dined with family and close friends in their private dining rooms. They might consult with their cooks from time to time, but for the most part, the cooks made all the decisions for the entire household and everyone ate what was served. Most people ate two meals a day, dinner at midday, and supper, in the evening. Breakfast, as a separate meal, was a later concept. Those who worked in the fields either took food with them or someone brought it out to them when it was ready. The word lunch meant snack—something that could be eaten while walking or working—for quick energy. Fresh or dried fruit, perhaps with a piece of cheese, was a common lunch. In the Medieval period, Europeans didn't have New World foods like avocados, peppers, potatoes, tomatoes, maize, and many varieties of squash and beans that we now enjoy. They also couldn't eat fruits and vegetables out of season the way that we can. So you would get the impression that we have more variety, but the truth is our variety has been whittled down to the main crops and domesticated animals that our food companies find most profitable. Historically, farmers grew a wide variety of grains, vegetables, and fruits in their fields and gardens. They also foraged for mushrooms, berries, nuts, and other foodstuffs in the woodlands. The open-air food markets in every town were filled with a huge variety of fresh and saltwater fish, live wild birds, fresh eggs of every kind of fowl, wild game, freshly slaughtered beef, pork, kid, veal, mutton, lamb, and horse. They also ate the whole animal, not just the muscles and fat as we do now. They ate the glands, brain, heart, lungs, liver, kidneys, marrow, tongue, and even the eyes! They had to get every bit of nutrition out of an animal because raising animals for food was so expensive. Most history books will say that it took over 2 hours of an average worker's wage to pay for an average meal. So imagine half your money going to food. That doesn't leave much for anything else and should make a person skeptical. On further inspection we see that most accounts of period food costs don't include foods not taxed or sold. Since so much food was raised in gardens, gathered in the woods, and raised on the farm, we can assume that at least half each the daily calories were not recorded this way. Also if we compare our current wages to the cost of restaurant meals, we'll see that it still takes one or two hours of work today, just as it did then. What did cost more was animal protein, spices, and sugar. We tend to believe that just because they didn't have electricity for refrigerators their food had be rotten. But, in fact, their diet was probably fresher and more vitamin-rich than ours. Food was grown locally, often right outside the kitchen, and it was eaten the day that it was picked. Animals were not slaughtered until needed for a meal, so the meat didn't have time to turn rancid. Fish were kept alive in vats until they were cooked. If meat needed to be stored, it was smoked, dried, or cured to prevent decay. Iceboxes and cold rooms were used in period to store the few items that needed to be kept cold. Ice was harvested in winter and kept in cellars packed in straw until needed. The iceboxes were made of stone and were quite efficient. Cold rooms were designed to keep butter, cheese, and barrels of fruit sweet for months. Grabbing a meal on the run for just a few bucks is not a modern concept, though branding it with logos and bundling toys with a meal is. There is evidence as far back as Ancient Pompeii that food vendors set up on corner locations to sell fried foods to busy shoppers and laborers in the city. In the middle ages, cart vendors set up shop in the markets and sold hot pies, pretzels, and many other foodstuffs to be eaten on the street or taken home. Americans love to eat with their fingers, and so did our ancestors. The fork wasn't even invented until the Renaissance and didn't catch on in England until much later. Spoons were mostly used to serve food and soup was sipped from the bowl rather than lifted to the lips with a spoon. If a spoon was used, it was more likely to be made of horn or wood than metal. People stabbed and cut their food with a personal eating dagger and picked up their food with their fingers. They put their large linen napkins over their shoulders to wipe their fingers and chins or they used the tablecloth. Wherever people ate, they covered the tables with tablecloths even when they went on picnics. Of course they didn't have paper plates on those picnics but they did have disposable dishes. They were called trenchers and were made of large slices of heavy bread. They could be eaten with the meal or given to the poor. That's much better than clogging our landfills with styrofoam and polystyrene. Eventually, trenchers disappeared as silver, gold, and pottery plates became fashionable, however the tasty bread that soaked up gravy was still on the plate in the form of sops, or as we now call it, stuffing, a very popular side dish. Speaking of side dishes, they didn't use a little plate on the side for their bread, they set it right on the tablecloth. That may explain why they always used tablecloths. Bowls and saucers were used for sauce (go figure) and they loved to dip meat and bread in sauces. The cooks prepared many different kinds from spicy meat gravies, to sweet and sour glazes, to smooth cream-based sauces. In fact, in wealthy manors they had one cook whose sole job was to make sauces. The most common drinking vessel was a small tazine about the size of a teacup without a handle. Larger, handle-less tumblers made from wood or pottery, were also common. The wealthy people owned glass drinking goblets, but they were too delicate for everyday use. They preferred gold and silver goblets. Metal or clay mugs, steins, and flagons (very large mugs) were a little less common and it looks like they were only used for drinking beer and ale. They also made mugs called "jacks" from boiled leather and bottles from goat stomachs. These lightweight botas were easy to carry. Flasks made of unglazed pottery could be soaked in water to cool the contents as the water evaporated. These bottles had small rings of clay attached to each side for adding a strap to sling over the shoulder. Archeologists have found small cups with similar rings that look like teacups with handles too small for any finger. They were probably worn hanging from a string around the neck. Cans and canteens were not made of metal, but were small wooden barrels that could be carried on a strap over the shoulder. One of my pet peeves is the notion that people were starving in the Middle Ages. Certainly wars and plagues caused famines from time to time and place to place, but for the most part, tax records show that huge amounts of food were transported from the farms and harbors into the towns every week of the year. When compared to the size of the population it amounted to over 3000 calories a day for every man, woman, and child. They needed this much food because they worked hard. The average person ate more than a pound of bread everyday! Heavy laborers ate one or two pounds of meat a day. France had such an abundance of food that they exported preserved meat and cheese. Even the poor could beg for food and receive it. Overeating, or gluttony as it was called, was such a problem that it was elevated from bad manners to a "deadly sin" on par with wrath or lust. If you think that we have too many diet gurus telling us what to eat and what not to eat and that the labels showing the calories, fats, and salt levels are too complicated, you would not want to deal with the diet rules and restrictions in the Middle Ages. Nearly every other day was a Church-mandated fast day, meaning meat or food that comes from animals—like eggs or dairy—could not be eaten or you would go to hell! Talk about a strict diet! If you were wealthy you could make a donation to the church and be absolved for eating butter on a fast day. Along with having to eat fish and vegetables on certain days, all food was classified as hot or cold, wet or dry. These four humors as they were known, had to be kept in balance or you would get sick. So the cook had to know if a kind of meat was considered hot (regardless of temperature) and dry, or cold and wet, and cook it with the opposite method to bring it into balance. That is why fish (cold and wet) were usually roasted (hot and dry) but birds were usually boiled. Not only were foods classified by the humors but also to what degree. So something could be hot to the first degree and wet to the third degree. Spices and sauces were used to balance foods' humors. It was so complicated that there was a brisk market in diet books and professional physicians acted as consultants to castle cooks. 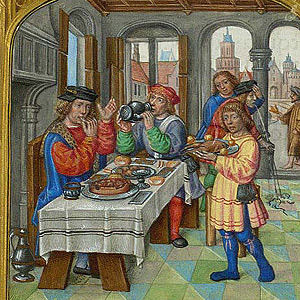 So you can see that there was as much anxiety over diet in the middle ages as today. Follow us on Facebook for the freshest information on new products, articles, and plans. If you want to add this article to your list of favorites or email it to a friend, please use this permanent URL, https://stores.renstore.com/-strse-template/1005A/Page.bok. Permission is granted by the author to quote from this page or use it in handouts as long as you include a link back to Renstore.com.